Mount Bromo volcano (Gunnung Bromo in Indonesian) in East Java is the active cone inside the giant Tengger caldera, one of Indonesia’s most scenic locations destination in East Java, famous for its magnificient sunrise views and the panorama over the caldera with Semeru volcano in the background. 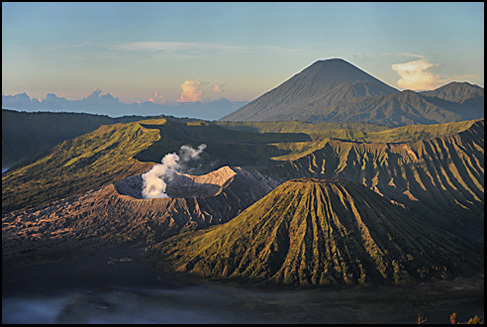 The Mount Bromo is a still active volcano and its peak culminates at 2.392 meters. The 16-km-wide Tengger caldera is located at the northern end of a volcanic massif extending from Semeru volcano. The massive Tengger volcanic complex dates back to about 820.000 years ago and consists of five overlapping stratovolcanoes, each truncated by a caldera. Lava domes and pyroclastic cones occupy the flanks of the massif. The Ngadisari caldera at the NE end of the complex formed about 150.000 years ago and is now drained through the Sapikerep Valley. 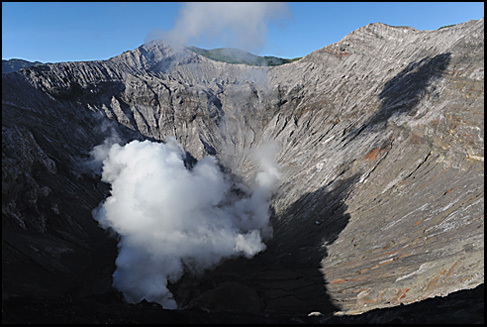 The youngest of these volcanoes is Bromo, one of Java’s most active and most frequently visited volcanoes. 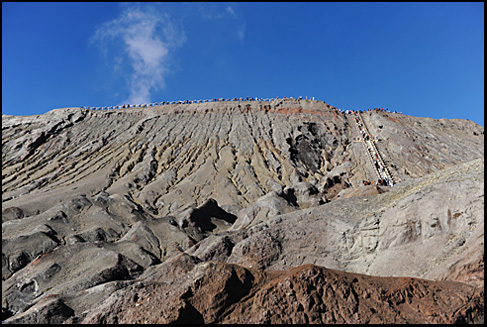 Mount Bromo attracts both tourists, and Tanggereses (local Indonesians living in the region). The sunrise on the Bromo, between five and six o’clock, when the temperature is between 0 and 5°C is a must for tourists. As you reach the top of the crater there is a constant stream of volcanic gas and ash pushed up into the atmosphere and if the wind changes take a deep breath and move out of the way. 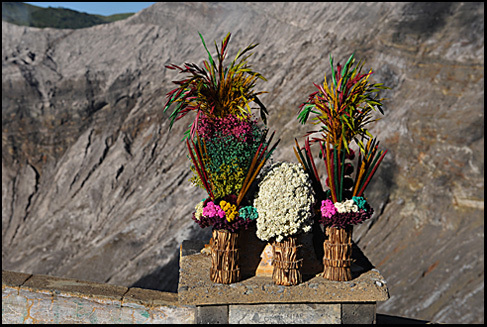 At the top you can make an offer by buying flowers, make your wish and throw them into the volcano. Believe it or not some wishes do come true. Unsurprisingly, this fine supernatural landscape has spawned countless myths and it is said that the Tengger crater was originally dug out with just half a coconut shell by an ogre smitten with love for a princess. But Bromo is of particular religious significance to the Hindu Tengger people, who first fled here to escape the wave of Islam that book over the Majapahit Empire in the 16th century. They still populate the massif. The Tengger believe that Bromo once fell within the realm of the child less King Joko Seger and Queen Roro Anteng, who asked the God of the volcano for assistance in producing an heir. The god obliged, giving them 25 children, but demanded Dian Kusuma, was sacrificed to the flames in return. When the queen later refused to fulfil her promise, the young Dian bravely sacrificed himself to save the Kingdom from retribution. 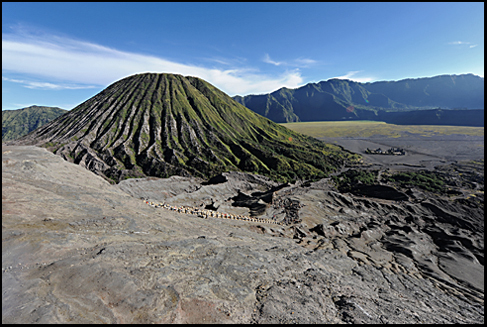 Bromo is a place where a natural beauty meets culture and history.